The Royal Society, having received accounts from very many parts of Great Britain, of the unusual lights which have of late appeared in the heavens ; were pleased to signify their desires to me, that I should draw up a general resation (sic) of the fact, and explain more at large some conceptions of mine I had proposed to them about it, as seeming to some of them to render a tollerable [sic] solution of the very strange and surprizing [sic] phænomena thereof. During the period of Halley’s investigation, the Little Ice Age dominated the decades and it bottomed around 1680. The Aurora Borealis actually expands and moves further south during periods of a colder climate. The Northern Lights being visible in the UK is not a good sign for climate change. This may be warning that we are headed back to a prolonged colder climate. Solar cycle 14 had the record high for sunspots during February in 1906. The annual peak took place in 1957 with 190 sunspots taking place that year. Based upon our models, the ideal low was most likely 1686/1687. From the 1957 high, the collapse to just 10 sunspots per year took place in 1964 — 7 years later. 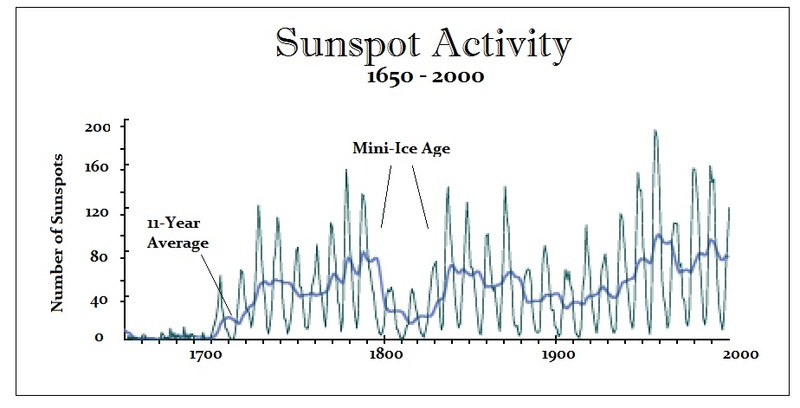 Just before the Mini Ice Age, sunspot activity peaked during 1787 at 132 (mean) and crashed for 11 years into 1798, dropping to just 4 sunspots. If we continue to witness this declining trend from the 2000 high where there are virtually no sunspots, we appear to be vulnerable to a significant decline at least into 2032.